I drove a yellow cab for a year in the 1980s. To work the night shift, you had to go into the garage for a “shapeup” at 1 or 2 in the afternoon and wait around until a cab became available, usually about two hours unless you bribed the dispatcher more than the usual $1. We did 12-hour shifts, from jerking our way through rush-hour traffic to trying to out-hustle other cabs for the few fares out after midnight. We worked under the specter of being robbed, cruising in the wee hours with $200 in cash in your pocket and legally required to take strangers anywhere they wanted to go. But as a single man, I could make enough money to cover my rent, child support and rehearsal space for my band after working two or three nights a week. We had a weak union, but we were still guaranteed a percentage of the meter revenue — 41 percent for beginners, eventually going up to 50 percent — plus tips and all of the 50-cent night surcharges after the first $4. A union official explained that this was the best system: If you were paid by the hour, there was not much incentive to work, but if you leased the cab, you’d lose money on a bad enough day. Leasing was exactly what the industry was changing to: Drivers rented the cabs per shift and also had to pay for gas. If you had a spectacular day, like three round trips to Kennedy Airport in light traffic, you could make more money, but on a slow day, you’d clock less than minimum wage after expenses. Leasing also made cabbies independent contractors and the union an illegal price-fixing scheme. By the early 2010s, driving a cab on weeknights typically paid around $100 a shift — barely minimum wage, and only $10 or $20 more than I’d averaged 30 years earlier. 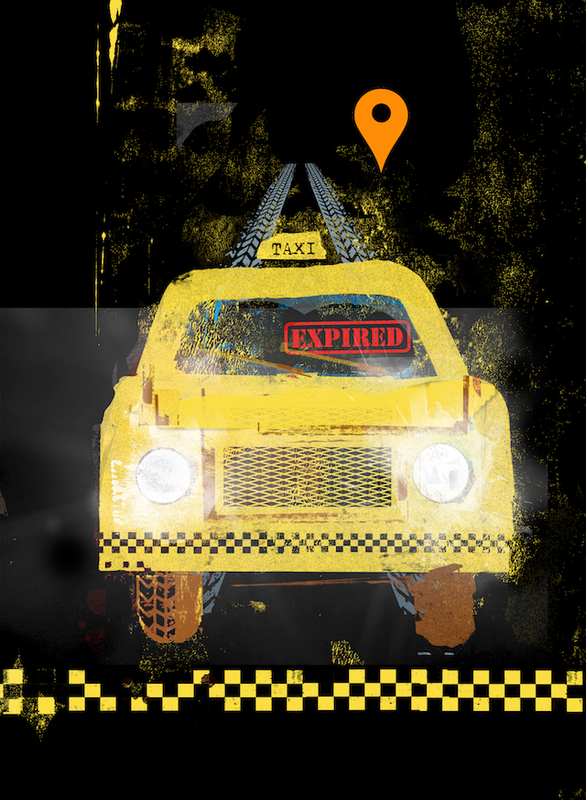 Uber’s business model is to flood the streets, Bhairavi Desai of the New York Taxi Workers Alliance writes in this issue of The Indypendent. As it gets a percentage of each fare and drivers pay for their own cars and maintenance, it doesn’t matter to them how little drivers make. And I now work in journalism, another industry where technology and the ruthless hands of the market have decimated workers’ incomes and job security. In the wake of Douglas Schifter’s suicide, the debt-strangled livery driver who took his life on Feb. 5, the time has come to make sense of the endless tragedy of American drivers’ exploitation. Despite the defeatist rhetoric of the U.S. media, the exploitative car-sharing industry can be beat. Let’s take a look at how this has been accomplished elsewhere in the world. UberPOP, the service that can turn virtually anyone with a driving license into a professional driver, is illegal in most European countries. This victory over digital capitalism was crowned by the European Court of Justice on Dec. 20. Brussel’s magistrates ruled that Uber is “more than an intermediation service” and should be regulated as every other transport provider. Several years of social uproar, however, were needed to counteract the deregulatory wave orchestrated by gig-economy lobbyists. On June 20, 2015, France experienced a wave of Uber-inspired protests that featured overturned cars and tires set on fire from Marseille to Paris. U.S. pop singer Courtney Love was caught up in the unrest and tweeted her frustration, claiming to feel “safer in Bagdad.” On Jan. 27, 2016, a Paris court ordered Uber to pay 1.2 million euros($1.5 million) to a taxi union and in July of last year the company was found guilty by French court of starting an ‘illegal’ car service. Riots rang through the streets of Rome, in Feb. 2017, where a coalition of cab driver organizations held protests for seven days. The uproar in Italy’s capital saw cherry bombs and clashes with police. A country-wide ban of all Uber services (including Uber Black, Lux, Suv, X, XL, Select and Van) was issued two months later. The Italian court decision, later thwarted by the company’s appeal, ruled that Uber constituted unfair competition among transportation services. Several months before the European Court of Justice ruled that Uber is in fact a transport company subject to regulation and licensing by E.U. countries, authorities in London ruled in September 2017 that Uber is not a “fit and proper’”operator and announced that its license would not be renewed. A British employment tribunal followed that ruling by mandating Uber consider its drivers “workers” and not “independent contractors,” thus allowing them access to the minimum wage and holiday pay. Indeed, it is on the very semantics of exploitation that digital capitalism is waging its class struggle. “I refuse to be a Slave,” declared Douglas Schifter in his last note. In a decade when Silicon Valley’s billionaires rewrite the English vocabulary to rebrand exploitation and disenfranchise workers, time is ripe to call out worker abuse, and to fight back. Photo (top): OFF-DUTY: Tariq, an NYC cab driver, takes a break from behind the wheel. Credit: Erin Sheridan. sometimes i feel is cab right to use . In decades cabdrivers are did one thing; driving a yellow cab, much as they could to make enough money to survive, and didn’t focus how to make things better, they believed the TLC will do that, because they are the ones who’s controlling everything in the taxi industry. Well, greed is out control, and as we know it TLC also to connected to other powerful group of people, that’s why $ 11 credit card processing free taken, doesn’t matter if you make only $40 dollars or 200, and how many of you take home $200 these days, and how many hours you work for that, and spit of seconds you could lose that, because cops are everywhere, and they are notorious about writing tickets. Cabbies sure they’re make mistakes, every human does that, even the president, but giving them a summons for just about anything (just ask any cabdriver about that!) cost well over $100 and up! And don’t forget, cabbies are working minimum 10 hours in the most congested and polluted (toxic fumes from every vehicles) city, and no stopping anytime, no restroom, no standing environment, and top of that, they have that most annoying taxi-TV in the back! Did I mention the slow credit card processing, and taxi apps? The worst commissioner in the history of NYC. LYFT IS TEAMING UP WITH AUTOMATIVE INDUSTRY GIANT, MAGNA DEVELOP SELF DRIVING CARS AND GETTING $200 MILLION …M G A – GM- GOOGL. LYFT TEST MONTHLY SUBSCRIPTION MODEL FOR ON DEMAND RIDES .THE PROGRAM PROVIDES UP TO 30 RIDES WORTH $15EACH .USING THE NORMAL RATES FOR $199 PER MONTH AND THERE’S A $399 PER MONTH VERSION FOR UP TO 60 RIDES. hey larry take a look at the top of the page. YellowCabNYC.com. You are not my brother. You are a menace and that’s all. Another NYC taxi owner committed suicide… For G-d sake stop this incompetent TLC Commissioner. She is a murderer. Who are all those corrupt and spineless NYS and NYC politicians who have taken political contributions from ride hailing companies and have caved in and shamelessly surrendered their souls by letting these leeches operate with immunity to the detriment, specially of individual taxi medallion owners? Montreal, Quebec, London and Austin Texas sided with the working people. So ride hailing companies are not invincible. A powerful share, I just given this onto a colleague who was doing a bit evaluation on this. And he in truth bought me breakfast because I found it for him.. smile. So let me reword that: Thnx for the treat! But yeah Thnkx for spending the time to discuss this, I really feel strongly about it and love studying extra on this topic. If doable, as you become experience, would you thoughts updating your blog with extra particulars? It is highly helpful for me. Big thumb up for this blog publish! Good education!! What’s up taxi guys? Low energy, nothing to share, and cab driving is taking away your happiness? Nobody know what to do and how to make positive changes in the taxi industry? Are we communicating, are you guys really care? Waiting for the TLC to make miracles? Thanks for writing and sharing this blog.I really liked the way you have explained and emphasized on the need of content management online.The ingredients listed by you will be very helpful for me as i work for Brand management and Corporate communications at Synechron.